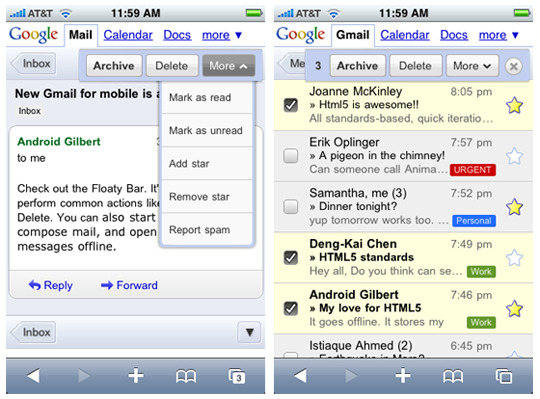 The new iPhone Gmail and Google Voice, how awesome? Everyone knows how much I love Google, and mostly that is because they often give extra special attention to iPhone users, with lots of their services being Optimized for the iPhone. (Except when it comes to Google Latitude – coming soon to iPhone indeed!). There are a few new features you’ll see right off the bat, like the Floaty Navigation bar, but by far the most impressive new feature is it’s offline support. When you visit gmail.com in your browser it now uses database storage to save your messages on your iPhone itself. Which not only improves loading times, but this means you can Star, Archive, and even write messages while offline and Gmail will update once you’re connected again. For someone who doesn’t use Mobile Data at all (hem, hem, Me.) this is a big deal. Now, the only caveat is that you do need to be running at least 2.2.1 for this update to work. I know there are a few people out there waiting to upgrade their firmware until 3.0 is available, but this new Gmail feature might make you think about grabbing 2.2.1 before 3.0 is out this summer. Another thing I wanted to mention since we’re talking about Google, is an article that I’ve seen floating around about Google Voice coming to the iPhone, in App Form, shortly. For some reason up until this news broke I had been blissfully unaware of the Google Voice (formerly Grand Central) service and so did a little read-up on the official Google Voice Page. Although there are many, many awesome features to this service the one that particularly jumped out at me was this: Voicemail Transcripts. Sound like something we’re already familiar with? Yeah, that’s basically Visual Voicemail. The reason why this popped out among all the other cool features is because, as a unlocked iPhone user, VV is the ONE functionality that I’ve been missing from my iPhone, o’ these long years. So as amazing as Google Voice would be for all iPhone users, I think that the unlocked population will be extra-specially excited, I know I am. 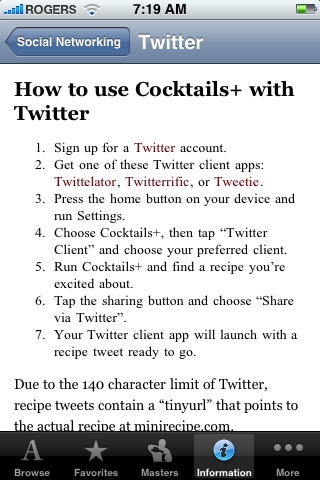 Cocktails+ App Review – On Sale, Free!